hai ragione Lilli, questo orologio sarebbe un regalo perfetto per Natale, quasi quasi seguo il tuo consiglio!! Eh si sarebbe un regalo perfetto, bello il set che hai creato! 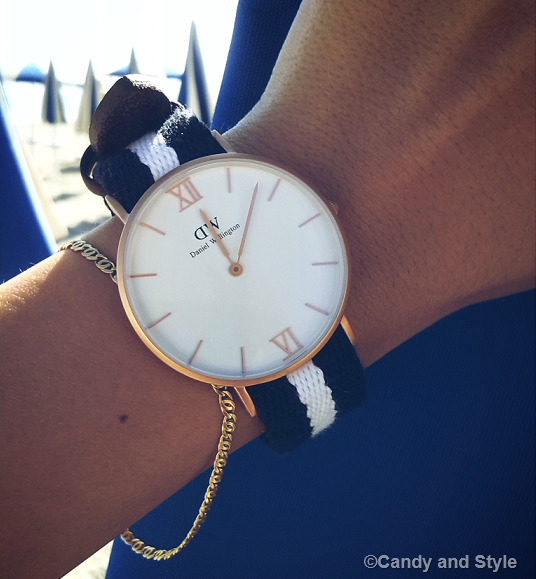 Daniel Wellington mi piace tantissimo!!! I looove loove the bucket bag! Gli orologi DW sono veramente belli ed eleganti. E bellissimo anche il secchiello MK del set. That watch would be a perfect Christmas present, has a versatile design that can operate in either summer or winter. Happy weekend Lilli! I agree with you. A watch is always a good idea. Effettivamente sarebbe un ottimo regalo di Natale. Un bacio Lilli. Buon fine settimana. E' bellissimo questo orologio! Un regalo perfetto! Very nice watch Lilli. I like the circular shape and navy blue strap. The navy blue matched with the camel brown looks so chic. Happy Friday! Oh, this watch is really beautiful! Cool set, I like these quilted slip on sneakers! di solito amo gli orologi in acciaio, modello unisex per capirci, ma ammetto che questo è davvero bello! I like your choises! !So preety!! I love the pink sweatshirt and the bucket bag!So cool!! Your watch is gorgeous! !Have a great weekend!Kiss! Hai ragione: un'ottima idea regalo, sono sempre molto chic i loro orologi!!!! Che bello il set che hai creato!!!! bellissimo, hai scelto un modello splendido! Molto bello questo orologio, di classe! I like your pink choices. This pastel shade is such a lovely change from all the dark wintery colours. The slogan on the sweatshirt made me smile too. I've been looking at bucket bags too as they are not only stylish but so practical too. Thank you for your sweet comment. I always enjoy reading your opinions. Have a wonderful weekend! Non ci crederai, ma ho usato la stessa maglia per proporre un look nel post di oggi che pubblicherò tra un po'. That watch is dope,def getting one after christmas. Thanks for the reminder Lilli! A watch would make a wonderful holiday gift! I really like the look you put together too especially the sweatshirt. The color is so pretty and the design is cool. Have an amazing weekend dear friend! Hi, Lilli! Amazing watch ...Thx for sharing..:-) Many kisses! Have a great weekend!!! Meglio approfittarne allora!! Bellissimi gli orologi DW e anche di grande qualità! Poi adoro il set che hai creato, vorrei ogni singola cosa! Poi il secchiello MK è stupendo!! Buon week-end Lillina! Your selection is great and a typical Lilli style. Now i´m in love with the MK buckle bag. Great selections; I'm loving that sweat shirt with the cute quotation on it. Bellissimo l'orologio! Un bacione tesoro. Grazie mille per il coupon Lilli, l'orologio è stupendo e mi piace troppo anche il look che hai creato! Se non fossi cosi spendacciona, avrei utilizzato il tuo sconto per prenderne un altro. Sono bellissimi, li trovo molto eleganti. Molto carino anche tutto il look che hai creato. Un bacione e buon fine settimana cara Lilli. 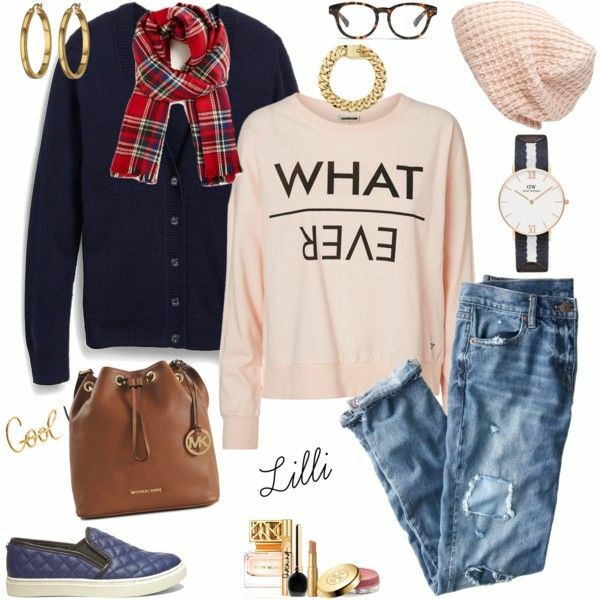 Thanks so much for sharing the discount Lilli and I Love those jeans and the sweatshirt too. I hadn't heard of this site so I'll definitely check it out!! PS - your outfit with the burgundy and denim is so stylish! The watch looks really beautiful! Hi Lilli..DW watches will be really a beautiful gift for Christmas. I really love these watches. I'm planning to buy another one for me. By the way the sweatshirt and the scarf is so lovely. Wish you a happy weekend my friend. Many hugs!! Thank you for the reminder about the voucher expiring. I don't think I'm able to use it though I feel that the watch looks really classy on you. I like to look at what you put together on Polyvore. I've always longed to do Polyvore but I know I would be hooked onto it and have no time for other matters. Just like when I was hooked on Pinterest and kept pinning stuff. The Whatever sweater screams attitude. I love it. And The quilted shoes look most comfortable. I enjoyed reading your make up essential. Your eyeliner sounds like a charm. Mine keeps smudging. Burgundy always suits you so well and it pairs very well with blue denim. Your leopard print flats look exactly like a a pair I've wanted to buy from Butterfly Twist. Hey sweetie Lilli. I smiled at your comment. I was awed by Liberty Square too. The huge space does seem like a good area to roam and relax. My hubby likes to purposely worm his way into my video or somehow do stupid things w/o knowing that I'm taking a video, rendering that video unsuitable for online viewing. Hahaha. Bubble tea is such an Asian culture and I do hope that my non-Asian friends like you would love the various varieties of bubble tea. Ciao Lilli!! Che bel set, mi piace!! !